After ESA astronaut Tim Peake returned home safely from his very successful and eventful mission, I was able to catch up with him in northern Norway en route from Kazakhstan with his NASA crewmate Tim Kopra. Even before setting off on his mission, Tim Peake had become something of a national hero but now he is known across Europe as a European Astronaut of British nationality. He proves day in, day out that ESA does not just talk about Europe but is the living and very dynamic embodiment of it. We at the European Space Agency ESA see the diversity of Europe’s national cultures as a very significant asset and draw great benefit from the different backgrounds, educations and competencies of our staff and Member States as we pursue our activities. European spirit is therefore alive and well and is constantly reaching out to new horizons. Today, cooperation in space reaches far beyond what was witnessed during the space race in the middle of last century. Within ESA, 22 European Member States and Canada join forces to conduct missions no single state would be in a position to afford alone. The spirit of cooperation and interaction within ESA has a remarkable decades-long track record and provides a solid foundation from which to tackle challenges now and in the future. At the Farnborough International Airshow I was able to witness at first hand the huge interest generated by Tim Peake in the UK. People of all ages came along to listen to his presentations on his experiences in orbit. 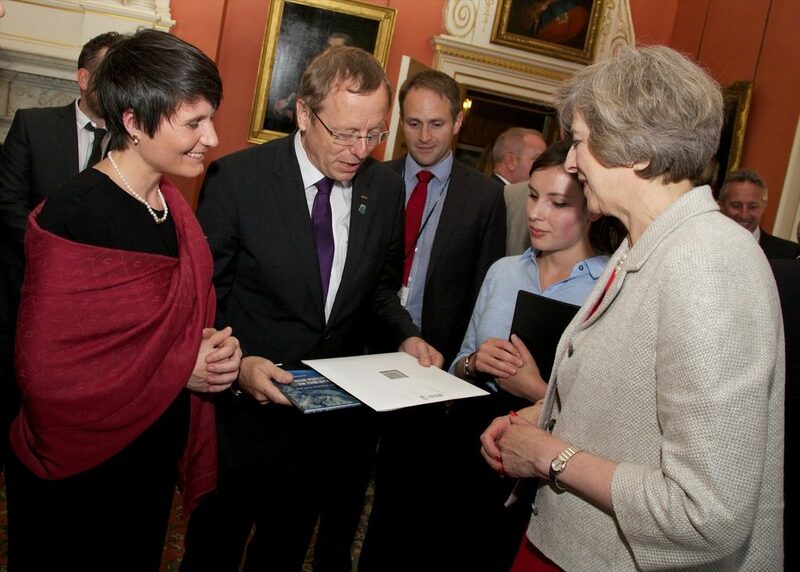 Meeting UK Prime Minister Theresa May at Tim Peake’s welcome reception with ESA Astronaut Samantha Cristoforetti. Image credit: A Parsons/UK Prime Minister’s Office. 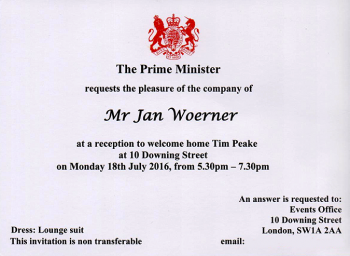 During my visit to the UK in the middle of July I was able to attend the welcome reception for Tim at 10 Downing Street and have a brief chat with the new British Prime Minister Theresa May. The next day, with a visit to ESA’s newest facility, the European Centre for Space Applications and Telecommunications (ECSAT) in Harwell near Oxford, I completed my annual interaction tour of the ESA sites, the motto of which this time was “Challenge me!”. Having now spent one year in the job of ESA Director General, the tour was much more intensive than immediately after my arrival in 2015. My visit to the UK was brought to a close with a presentation to the Royal Aeronautical Society in London. Although the topic was of a more general nature (“United Space in Europe”), the discussion focussed very much on Brexit and the possible consequences for British industry and science. As an intergovernmental organisation, ESA is not directly affected by Britain’s EU referendum result and can even play a special role in overcoming possible problems by using the instruments at its disposal for future space cooperation in Europe. Travelling back to Paris proved easier said than done as our Eurostar train was cancelled due to a fire at Gare du Nord. We decided to take a taxi to Dover, managed to get on a ferry, usually not possible for foot passengers at night, before being met by car in Calais and brought safely back to Paris. It sounds easy enough, but there were many obstacles to be overcome … just another day in the life of an ESA Director General. On a much more serious note, I could not possibly publish this latest blog post in which I have emphasised the great achievements of people of diverse origins and cultures working in harmony and mutual respect without also speaking of the recent violent attacks on innocent people going about their daily lives. Two days ago, once again, we saw horror come to the streets of one of our cities. It is therefore with great sadness that I extend, on behalf of everyone at ESA, our deepest, heartfelt sympathies to the friends and families of the victims of these recent senseless attacks, and all those caught up in them, while we honour the memory of those who have been lost. Co-operation and diversity are wonderful things. Can we consider the peaceful cooperation the good story and reality of the present but also the only one of the past? Can we consider the peaceful competition also positive and a good example? I do, even if I share your same views proposed in a wonderful message I’ll never forget you delivered in july 2015 envisioning an international cooperation (which has also came to reality for exampke with the Esa Caves joined also by China for which I was really happy). I believe also the past shall be remembered in bad or good as a great moment of progress, knowledge also if many discoveries were made under cold war, hot wars or by regime (like the NationalSocialism in III Reich). Science is science (knowledge) and we can’t censor it for all the important inputs and constructive regenerating inspiration we receive from it.